You can use the form to the right to get in touch about a custom order. The current wait time is estimated at 3-5 weeks after payment is received. Unexpected delays (due to supply shortages, etc) are unlikely, but possible. 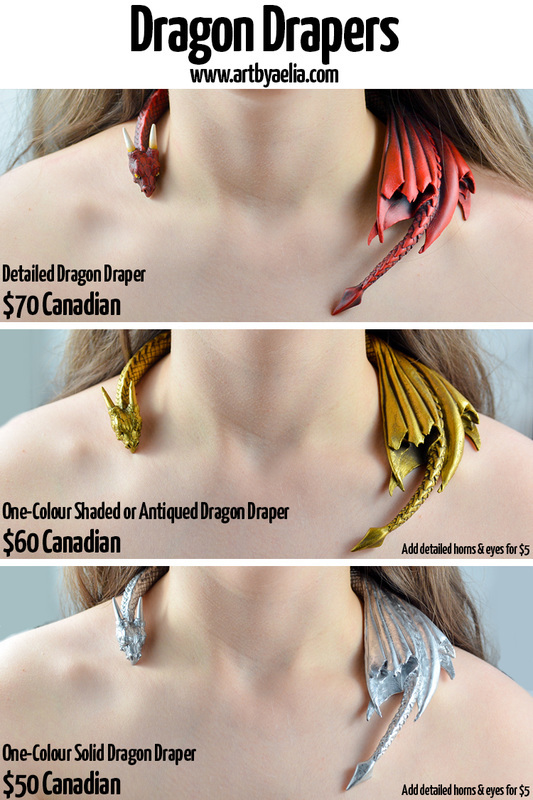 Want to order a custom Dragon Draper Necklace? I need to know what country you live in so that I can give you an accurate quote including shipping. Please choose the painting style of the Dragon Draper you would like. See the image beside this contact form for examples. Tell me about the design you'd like for the Dragon Draper Necklace. IF you would like detailed horns and eyes. Detailed horns and eyes are included with detailed Dragon Drapers. This detail is $5 extra with One-Colour or One-Colour Antiqued or Shaded Dragon Drapers. If you are not ready to order upon receiving the custom order invoice, please wait to place the request until you are ready. Payment in full is required before I can start your order.